A hotkey feature to open the clipboard history has been available in Diodon since its very first version and is a major part of its usability. Unfortunately this hotkey has not always worked as expected, causing issues on certain desktop environments or stopped working altogether caused by regressions of updated libraries. Furthermore did customization of the hotkey not always work like when using Symbols or sometimes even the order how the keys were pressed mattered. All in all has this feature not been very stable. The main underlying problem for this is that there is no standard across desktop environments to register global hotkeys. Looking at all those issues it is kind of obvious that handling of a hotkey should not be the responsibility of Diodon but be handled by the desktop environment itself. Therefore the decision has been made to drop the internal Diodon hotkey feature altogether as per version 1.4.0. Instead does a custom shortcut need to be registered through the settings offered by whatever desktop environment you use. For GNOME/Unity this can be done by opening Keyboard app through the Dash/Activities overview. 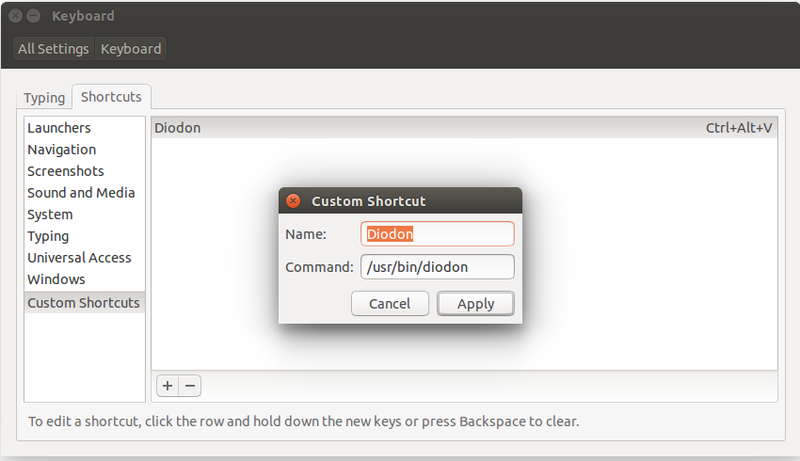 There you go to Shortcuts -> Custom Shortcuts and add a new one with the name “Diodon” and command “/usr/bin/diodon”. Afterwards assign your preferred hotkey and you are done. If you are experiencing a hotkey issue with the current Diodon version you use you can already do this. We believe though the additional stability in the hotkey feature it makes up for this one-time manual step. Also we are working together with upstream of the different DEs so hopefully in future versions of Diodon this custom shortcut registration can also be done automatically during package installation again. If you have any questions or concerns about this change leave a comment – feedback is always appreciated. And if you actually know a way how an application could register a custom shortcut during installation best have a look at this question. After a long time of silence have we released a new Diodon version 1.3.0 focusing on stability of the clipboard manager. You can find a extensive list of what has been changed on the release page. I herewith also specifically wanted to take the opportunity to say thanks to you all reporting bugs. All those reports are really helpful and essential to make Diodon better. Also if in the future Diodon doesn’t behave as you expect it to, please do not hesitate to report it. This said happy copying and there are certainly more Diodon versions coming up in the future. Why does Diodon not save anything to the clipboard history? This question has been asked a couple of times also on AskUbuntu so I thought it is worth a blog post to elaborate on why in certain circumstances Diodon doesn’t save anything to the clipboard history and what you can do about it. Since version 1.1.0 the way how Diodon stores its clipboard storage has changed – it used to be that the history was simply stored in the storage.xml file located in ~/.local/share/diodon/. This was fairly simple but had the limitation that the clipboard history was limited to a certain number of entries. If we wanted to increase this number but still using the single xml file Diodon would consume way too much memory and would have become too slow as well. To overcome this limitation have we moved away from this xml file and integrated a library called Zeitgeist. Zeitgeist is a service which logs the users’ activities and events, anywhere from files opened to websites visited and conversations had. As Diodon pretty much records users’ copy events is using Zeitgeist service a really good match. Besides recording Zeitgeist also provides a simple way to search certain activities and managing history which gives Diodon beside an infinitive clipboard history many more opportunities read more about it here. But let’s get back to our initial question on why Diodon does not save anything to the clipboard history. For this we have to know that Zeitgeist has a privacy feature so it is possible to disable recording of any users’ events. 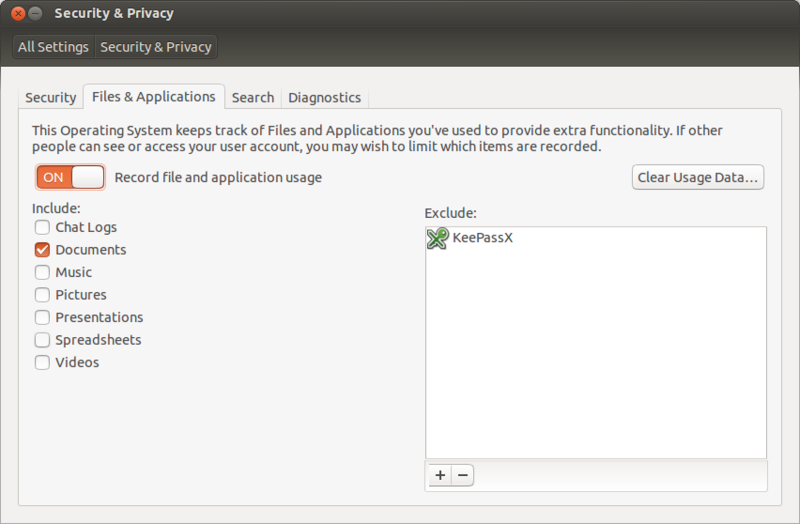 This option is to be found in your “System Settings” -> “Security & Privacy” -> “Files & Applications” where it says “Record file and application usage”. When you turn this option off no users’ events will be recorded including copy events by Diodon. This means you can still access previous copy events recorded before disabling this option but no new items will be added. You properly ask yourself now how you can simply allow Diodon to save copy events but disable other applications from recording anything? This is possible but at this stage not as apparent as it could be. In the same Security & Privacy dialog from above there is the possibility to enable recording but only including certain activities. Unfortunately is there no entry to simply include Clipboard. This is something we would really like to see in the future and are working on it – you can follow progress in this bug report. For now as a workaround to still allow Diodon to save copy events is to at least allow activity “Documents” to be recorded. When this option is set you should be good to go and Diodon should start adding clipboard items to the history again. I am glad to announce that another Diodon version has been released today with mainly changes underneath the surface such as improving API for plugin developers but also fixing some annoying bugs. Thanks to everyone involved who made this release happen providing translations, reporting bugs, working on packaging, contributing source code or just simply using and advocating Diodon. Hope to see many more releases ahead. Where is my Diodon monochrome icon? You might have been using Diodon for a while and are wondering why there is no monochrome icon in your panel but instead a colored fish? The icon does look a bit out of place in this specific theme. Unfortunately it is impossible to create an icon which suits every theme very well and if we would use a monochrome icon as the default it might not even show up on certain themes. That’s why we have decided to have a colored fish as the default panel icon as it is at least visible on all themes. For some commonly used themes we made some exceptions to use the monochrome icons directly. However, in case you use a completely different theme and you would still like to have a Diodon monochrome icon there is a fairly quick way to do it. In both cases replace [MYTHEME] with whatever theme you are using. Done. When you now close Diodon and open it up again a monochrome should be shown in your panel. What I would recommend you though if you want to have a more permanent solution: Get in touch with your theme author and ask whether he would be willing to ship a monochrome icon for Diodon. In the end does the author know best what suits its theme and when the Diodon icons are shipped with the theme itself all users will benefit.